Dog’s mercury is a perennial plant; the round, furrowed, glabrous, branched stem bears opposite, dark green, ovate, serrate, hairy leaves. The flowers are light green and axillary, the male in spikes, the female solitary or in 2’s and 3’s. Flowering time is April and May. Another variety: Mercury herb (M. annua) is an annual species of mercury with a square stem and light green leaves. 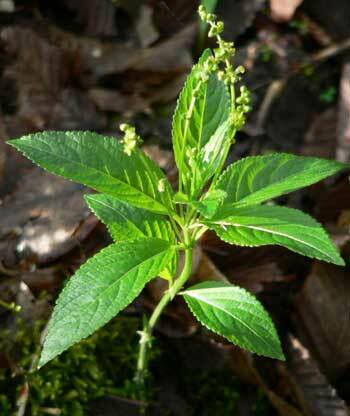 It is used like dog’s mercury and is similarly poisonous. Grows in waste places in the eastern United States; naturalized from Europe, where it grows especially in shady mountain woods. The fresh plant is sometimes used as a laxative. A homeopathic tincture is used for rheumatism and stomach problems. The fresh plant is poisonous, and the poison is believed to be cumulative in effect. Thorough drying or boiling seems to destroy the poisonous activity.